The Canadian construction industry lost a ‘master builder’ and humanitarian Thursday November 18, 2004, with the passing of Harold Green, Chairman of Verdiroc Development Corporation and Principal of Greenwin Property Management Inc. Mr. Green was 78 years old and is survived by his wife Miriam, his children Eric, Cary, Kevin and Robin and 10 grandchildren. Harold first learned the construction trade as a teenage bricklayer building baking ovens in Toronto with his brothers Sam and Al. From there he joined Greenwin Construction Company, established by his father, Lipa and Arthur Weinstock. Harold took over its construction division by the early 1950’s. During the next two decades, Greenwin became one of Toronto’s largest residential builders and developers. In 1978, with his sons, Eric, Cary and Kevin, Harold started Verdiroc Development Corporation, which builds residential, commercial and institutional developments across Canada. Recognized throughout his career as a construction industry innovator, Mr. Green was among the first to embrace the concept of mass-produced housing components. He used this new method in Don Mills, Canada’s first master-planned community in the mid-1950’s. This same construction principle continues to be used today. He brought the same passion for innovation to high-rise construction in the 1960’s, when he implemented a new system of construction called the “flying form”. The forms were used as moulds for the concrete. They were assembled and hoisted, level by level, as each floor was poured. Prior to that, large structures were built using the “craft system”. Besides revolutionizing the construction process, Harold Green also modernized the role of the construction labourer. In co-operation with the labour union, he created “formwork”, which required a multi-skilled workforce. This advancement greatly reduced both construction time and costs. Mr. Green’s childhood was influenced by his parents’ strong social and political convictions and these ideals were a benchmark of his career. Early on, he recognized the importance of a good relationship between management and labour and the value in fair dealings between the two. In 1967 he founded and was the first President of the Metro Toronto Apartment Builder’s Association which forged the first collective agreement between workers, employers and the unions, and established, for the first time, medical, dental and legal aid benefits as well as a pension plan for construction workers. 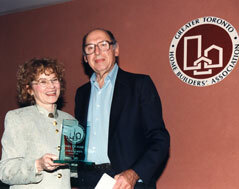 Amongst the many accolades he received when inducted in 1998 to the Greater Toronto Home Builders’ Association Hall of Fame, was a special tribute by former union officials who praised his ability to bring order and fairness in a chaotic time. 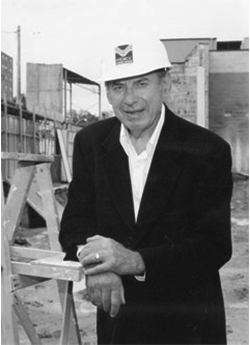 As a home builder and a community builder, Mr. Green was well-regarded as a tireless philanthropist who contributed to a myriad of causes in Toronto and throughout the world. Although he typically shunned the spotlight for his charity work, he did accept a lifetime achievement award from the Mt. Sinai Hospital in 1998. He and his wife Miriam were awarded the Peace Prize from the Canada Israel Children’s Centre that same year. Harold Green was one of Canada’s great builders – a man who worked throughout his life to build a better community.